A few weeks ago we celebrated the first birthday of our little boy. 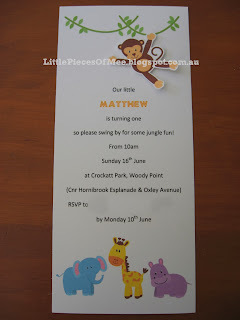 I decided to go with a jungle theme for the invitations, cake and party food for our cheeky little monkey. For the party food, I wanted to incorporate the jungle theme into some of the food, like the apricot fish that I did for my daughter's 5th birthday, but despite many google searches I couldn't find the sorts of things I wanted to serve that were relatively easy to prepare. So about a week before the party I decided to put my thinking cap on and come up with my own jungle food. The first idea that I had was to make zebra brownies, using my normal brownie recipe and a zebra-stripe template (which I cut out of some cardstock using my Cricut machine and a zebra pattern that I found on google) and some icing sugar to make the tops of the brownies look like zebras. My next idea was giraffe cheesecakes, using my usual baked cheesecake recipe but I figured that I would bake it in a slice tin rather than a round spring form pan, and then cut the cheesecake into squares. For the giraffe pattern, after much thought about what would look and taste best, I decided to use some caramel Ice Magic and a giraffe-pattern template (which I also cut on my Cricut machine using a giraffe pattern from google) to decorate the tops of the cheesecake squares. Then I decided to make some monkey-tail biscuits based on a recipe I had for strawberry swirl biscuits but making the swirl with a chocolate swirl instead. The recipe is at the bottom of this post. 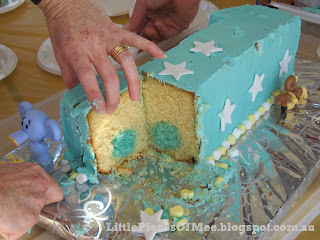 For the birthday cake, I made a number one shaped cake, as I had done for the first birthdays of my two daughters. I also made the cake with blue circles through the middle of the cake, similar to the pink hearts inside the Ariel cake and the green flowers inside the Tad cake I had made for my daughters' birthdays earlier this year. On the night before the party, the cake had been baked and I was attempting to decorate it. I covered the cake in blue buttercream icing and was trying to work out how to incorporate the little monkey, elephant and giraffe figurines I had bought. I experimented with using green icing to draw leaves and vines but that didn't turn out too well (luckily I did my testing on a sheet of baking paper not the cake). So instead I cut some big stars out of some white fondant and placed these on the cake. I made a border out of white and yellow mini marshmallows (cut in half). I put the monkey on top of the cake with a number 1 candle and then put the elephant and giraffe on the cake board at the bottom end of the cake. I was so happy with how it turned out, even though it was nothing like I had imagined it to be. As you can see from the photo, the blue circles didn't end up in the centre of the cake - I think I put a bit too much batter in the bottom of the tin before I put the circles in. I was happy that the colour of the blue circles matched to the icing though - I didn't think about that when I was colouring the icing so it was a bit of a fluke. Best of all, my little boy seemed to love his cake and wasted no time gobbling up his slice. 1. Beat butter and sugar in a bowl with electric mixer until creamy. Add egg and beat until combined. Stir in sifted flour. Divide dough into 2 equal portions. 2. Place each portion in a bowl. Mix vanilla essence into one dough portion. Sift cocoa powder into the other dough portion. Mix through until dough is a solid brown colour (you can add extra cocoa if you prefer a darker colour). 3. Turn the vanilla dough onto a lightly floured surface and knead in a little extra plain flour so dough is no longer sticky. Repeat this step with the chocolate dough (omit the extra flour). Wrap dough portions separately in plastic wrap and refrigerate for 20-30 minutes until firm. 4. Roll out the plain dough between 2 sheets of baking paper to form a 22 x 32 cm rectangle. Repeat with chocolate dough. Ensure both rectangles are the same size. 5. Remove the top sheet of baking paper from each dough rectangle. Invert the chocolate dough over the plain dough and lightly press the two dough rectangles together by running your rolling pin over the top. Remove the top sheet of paper. Roll up the two-tone dough from the long side using the baking paper as a guide. Wrap the roll in baking paper and place in the fridge for at least 30 minutes until firm. 6. Preheat oven to 180C. Remove the dough log from the fridge and roll the log on the bench to even out any flat spots. Unwrap log and cut into 1cm slices. Place slices, about 3 cm apart, on baking-paper lined oven trays. Bake in oven for 12-15 minutes until light brown around the edges. These biscuits will keep for up to 2 weeks in an airtight container. 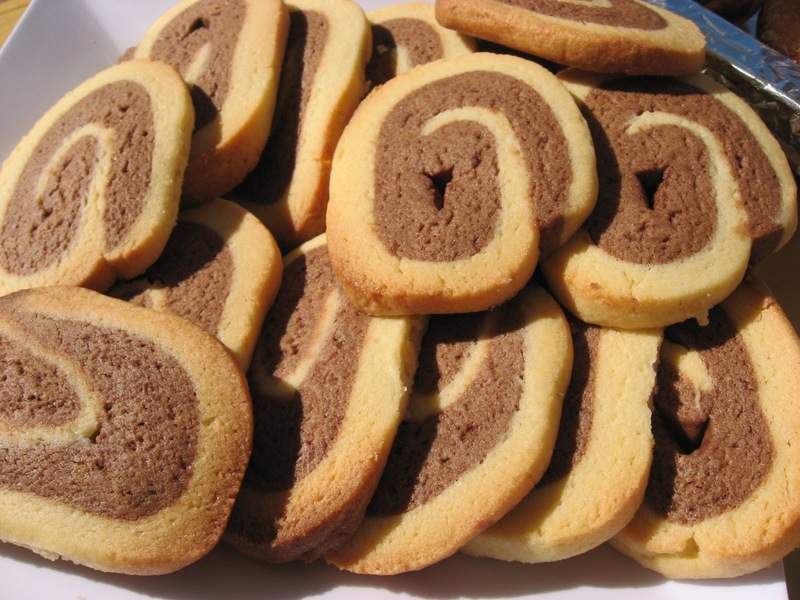 If you prefer to make strawberry swirl biscuits, use 1 tsp of strawberry essence and a few drops of pink food colouring instead of the cocoa in step 2. Add the extra flour in step 3 as for the vanilla dough.